It all happened in the blink of an eye. What was supposed to be a fun camping trip, quickly turned into a life or death situation for 25-year old Savanna Poirier. After wrapping up a day at work, Savanna and her boyfriend packed up their things and headed toward Fort Collins, Colorado for a bit of fun and relaxation. The pair were going to be camping with another couple for a birthday celebration. With plans for some paddle boarding and barbequing, the couple had hopes of a few nice days away. They arrived at the campsite in the evening, set up their gear, and enjoyed dinner with their friends. Before settling in for the night though, the foursome decided to climb aboard a 4-wheeler to do a little goofing off. Designed for just one rider, four people was far too much for this small recreational vehicle to handle safely. Without helmets or safety gear, the group cruised off into the area surrounding their campsite. Between the darkness, an unbalanced load, and no safety gear, things quickly took a turn for the worst. The ATV careened off the side of a hill and all four riders took nasty spills. With just cuts and bruises, Savanna’s friends were quickly on their feet, checking on one another and the extent of their injuries. Savanna on the other hand, was not so lucky. Once the group was able to locate her, they saw that Savanna had a large laceration to the back of her skull, clear injuries to her face, and a badly broken forearm; the group knew they needed to get her to help and fast. Flagging down a pickup truck on a nearby road, the group was able to get Savanna to a spot where they could call out to the local 911-dispatch center. Local law enforcement and paramedics arrived quickly. 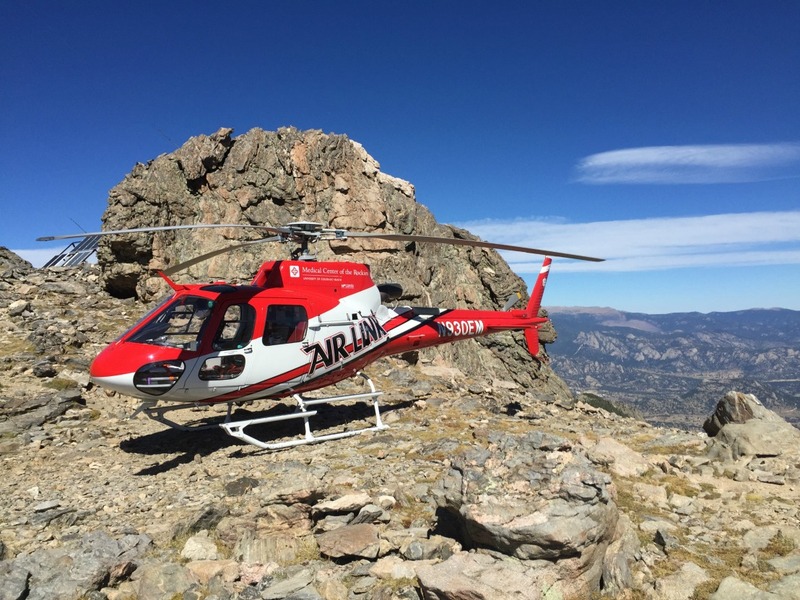 After assessing her condition, the decision was made to shut down the highway and request an air medical transport from Air Link at Medical Center of the Rockies. Air Link helps transport hundreds of patients like Savanna each year to needed medical care. On duty with Air Link that night were Pilot Michael Tucker, Flight Nurse Ryan Bushmaker, and Flight Paramedic Gary Davis. Within minutes of receiving the call, Michael had the aircraft circling above the emergency landing zone that had been set up for them on the highway. Savanna was losing a lot of blood, which caused her blood pressure to drop and her veins to start collapsing. In order to stabilize her blood pressure, Ryan had to drill directly into the bones in Savanna’s shoulder to start an intraosseous infusion, which provides a non-collapsible entry point for fluids. Once the clinical team had Savanna stabilized, they loaded her into the aircraft and prepared for the short transport to Medical Center of the Rockies. Air Link is proud to serve the community of Loveland, Colorado. In anticipation of Savanna’s arrival, the hospital had prepared a trauma team to care for her. When the aircraft touched down on the helipad, a trauma surgeon was standing by to meet with the clinical crew. In the hours, days, and weeks following her transport, Savanna underwent multiple surgeries to help repair her injuries. The back of her head had been cut so badly that she required a skin graft and several staples. Vertebrae in her neck were damaged and there was bleeding in her spinal cord. She suffered a broken forearm, two broken eye sockets, and a broken nasal cavity. She also lost so much blood that night that she required several transfusions. If you ask Savanna about her accident, she will tell you that she doesn’t remember anything of that night. What she has learned about the evening’s events has been pieced together from the accounts of her friends and from her reunion with the medical crew at Air Link. We are happy to report that Savanna is out of the hospital and is well on her way to making a full recovery.